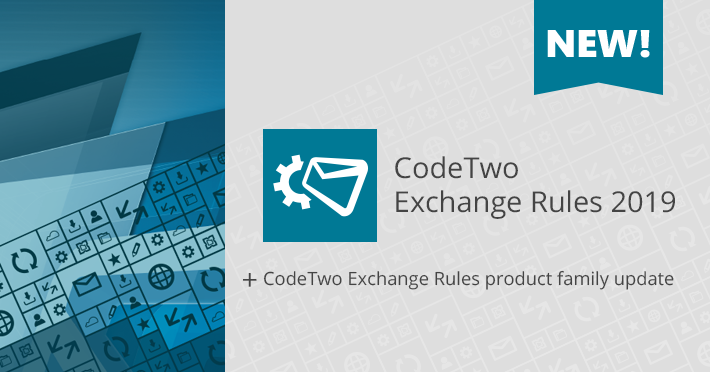 Our CodeTwo Exchange Rules family of products has been expanded with a new solution designed for Exchange Server 2019 – CodeTwo Exchange Rules 2019. The program allows you design and deploy email signatures and disclaimers centrally, for each user or group of users in your organization. Plus, it comes with a ton of features that significantly enhance the handling of signatures in an Exchange organization. The latest version of Exchange Server brought quite a few improvements in terms of security and performance; however, changes that impact the end-user experience were rather subtle. It is worth mentioning that Exchange 2019 supports email addresses that contain non-English characters, but in the context of email signatures there were no changes at all (make sure to check this Admin’s Blog entry to get a better insight into all new features of Exchange 2019). And this is where CodeTwo Exchange Rules 2019 comes into play. Since Microsoft strongly recommends deploying Exchange Server 2019 on Windows Server Core, mainly for security reasons, I suppose you will be happy to know that the core components of CodeTwo Exchange Rules 2019, responsible for processing emails and attaching email signatures, can also be installed on the Server Core version. Keep in mind that you still need to install the program’s Administration Panel on a client machine that has a graphical user interface (GUI) in order to configure email rules, create signature templates, edit program settings, etc. In conjunction with the release of CodeTwo Exchange Rules 2019, an updated version of our award-winning email signature and email flow manager, CodeTwo Exchange Rules Pro, has also became available. Although the program can be used with Exchange 2019 for quite a while, it is now also possible to deploy it on the Server Core version of Windows Server. The update is free of charge for all users who own CodeTwo Exchange Rules Pro 2.x license. To update the program, simply download its latest version (2.12.0.0) and install it over the previous version. You don’t have to worry about configured email rules or program settings – they will remain intact. The trial version comes also with 24/5 technical support – our technicians can help you set up the program or create your first email rule. See for yourself how CodeTwo Exchange Rules family of products can benefit your Exchange organization and how easy it is to deploy and maintain email signatures for all employees. This is really nice. Thanks for sharing.